Have a New Legal Problem? Our online application is an interactive interview that will walk you step by step through our intake process. This easy to follow question and answer session will help us better understand your problem so we can give you a more accurate response to your needs. It also saves our intake workers time and allows us to help more people. Our online intake system has been operational for three years and in that time it has enabled us to promptly process over 8000 applications! Rest assured that your data is safe and will not be shared with anyone. Click here or click on the picture to the left to apply today. Haga clic aquí para completar la solicitud en español. Tax intake for clients of free tax preparation sites click here. Our Columbus office is located at 1108 City Park Ave. and handles cases for people with legal issues in Franklin or Madison counties. For a new case please call our Intake Line at 614-241-2001 or toll free at 1-888-246-4420. Our Intake Line is open Monday through Friday from 9:30 a.m. to 3:30 p.m.
For general inquiries please call 614-224-8374 or toll free at 1-877-224-8374. Our Marion office is located at 150 Oak St. in Marion and handles cases for people with legal issues in Delaware, Marion, Morrow, and Union counties. You can contact our Marion Office at 740-383-2161 or toll free at 1-888-301-2411. The phone lines are open 9 a.m. to 12 p.m. and 1 p.m. to 4:30 p.m. Monday through Friday. Need To Talk To Your Attorney? If you already have a case with us and need to talk to your attorney, please call your local office and ask for them by name. Do You Need A Speaker For Your Event? Click here to request a speaker or contact Kate McGarvey at 614-224-8374 ext 146. Are You With the News Media? 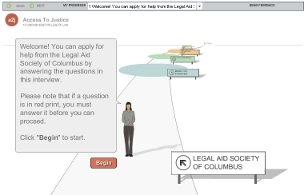 We would be glad to talk to you about The Legal Aid Society of Columbus. Click here to schedule an interview or contact Melissa Kossler Dutton at 614-737-0144. Want to Volunteer at LASC? We would love to have you. Please check our Volunteer and Pro Bono section.